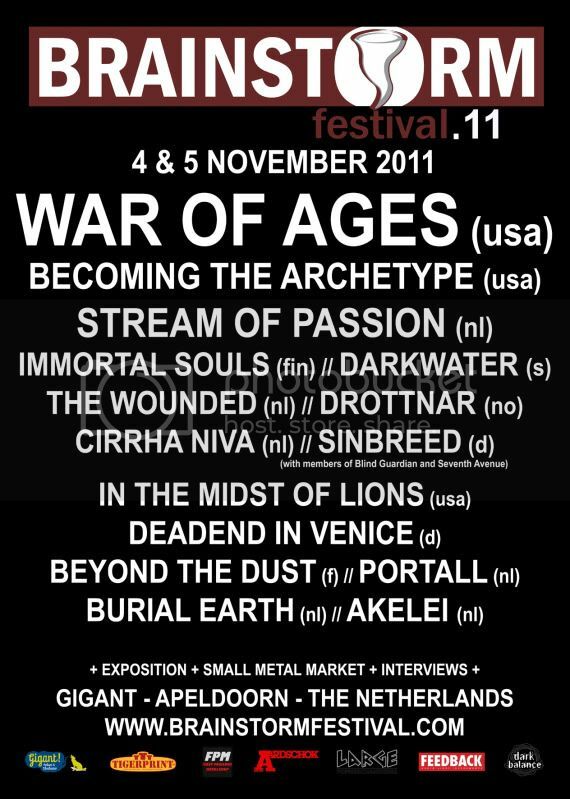 So today it is exactly one year ago that we released ‘De Zwaarte van het Doorstane‘ at the Dutch Doom Days IX festival. The album has gotten only positive reviews and has sold a nice amount of copies. We would have played more gigs but physical injury and lack of a bass player meant that we had to turn down a few offers. Those annoyances proved temporary though and yesterday we finally had an opportunity to show ourselves on stage again, at the Brainstorm festival in Apeldoorn. It was a good experience and we enjoyed playing there. It was Harm’s stage debut with Akelei and he did a great job. We sold and signed quite a few cd’s after the gig. Thanks to everybody who came out to see us, talked to us and bought a cd! We also thank Raffi and co. as well as Gigant for creating such a premium event and for taking care of us and the other bands so well. We will share pictures and video of the gig when we get them. If you haven’t heard already, Secret Quarters released Omit‘s debut double album last month and you should check it out. It features Cecilie Langlie (from our Duett) on vocals. Definitely much better news from Oslo than the tragic and shocking events that took place there in July… It’s the best doom metal album I’ve heard all year and one of the best debuts in several years. The music is highly atmospheric and emotional with classical arrangements, including strings, piano and lengthy compositions. Hear samples here and order the double cd (5 songs, 85 minutes) here. Essential album, not to be missed! So what has Akelei been up to in the last couple of months? The answer is quite simple and perhaps boring: writing. Just as I thought we had some promising songs nearing completion, I got tired with how they sounded and decided to rewrite and rearrange everything. The focus now lies on creating ever-developing segments instead of repeating the same parts over and over again. That’s enough challenge as it is but we’re also incorporating new instruments and vocal arrangements. I daresay the next album will sound rather different from the first! I can’t give away much at all just yet, but I can tell you this is a passionate learning process, sometimes painful, often slow, but always deeply rewarding. Although there isn’t much group activity to report on during the summer months, what with band members away on holiday and the rehearsal space closing for a month, we want to keep the blog updated anyway so here’s an idea that might entertain/inform/inspire/annoy/confuse* you. I asked everyone in the band which song they currently have on heavy rotation, preferably something recent, and to explain what makes this band or song so great. It will give you an insight into our listening habits, which surprise surprise aren’t always what one might expect from a bunch of doomsters. This song was written right after the earthquake that hit Japan in March 2011. The track is featured on an extensive compilation album in an effort to raise money for the Japan Earthquake Relief Fund. The reason why I chose this particular song is the same reason why I like everything Keith puts out under his Goldmund moniker; the sound of a piano, played softly, with restrained and melancholic arrangements. There’s a certain fragility present in his playing which I love, as he tends to leave all the creaking noises from the piano in the final mix. Music like this ends up in my headphones at least a few times a week. Agalloch is a band I fell in love with many years ago, shortly after the release of their second album ‘The Mantle’ in 2002. Musicwise it’s a mixture of black metal, folk and some heavier (doomlike) stuff, yet filled with layers upon layers of melody. This song is from their latest effort ‘Marrow of the Spirit’, an album that amazed me from the first second I put it on (not counting the intro then of course hehe). The only bad thing about Agalloch is that it’s really not a live band, because the songs are too layered to be played with the current setup of musicians, but on the other hand, the way in which they present their songs in a live situation adds some new and interesting stuff to the compositions. Definitely check them out when you have the chance! (In an email from Spain:) This song is long, epic and built up very well. It’s about someone who experiences hard times, who has lost the will to carry on and screams out his despair. However, at the end of the song there is a sense of hope and encouragement in the words, giving strength to carry on. Today I was on a train with this song on my headphones as we were passing through a tunnel and all was dark. That just really seemed to suit the song, it somehow made sense. I really got a kick out of that. There is a handful of recordings of this little-known English band on Youtube. As far as I can tell they are currently working on their debut album. Everything about this song moves me; the melody, the vocals, the lyrics. It is a very simple and pure composition, there are no odd transitions/rhythm shifts/sound effects here. The song precisely captures the feeling of not being enough for someone else, no matter what you do, and the feelings of powerlessness and restlessness that come with it. It’s difficult to pick only one song from this album as they’re all great in my opinion. ‘Torches’ is Foster the People’s debut album but you can’t tell from the quality of the songwriting nor from the clever arrangements. What I like so much about the music is that it feels airy and fresh yet warm and nostalgic. And above all: incredibly catchy. I don’t play a lot of poppy music but I’ve been listening to ‘Torches’ pretty much daily since it came out, it really is rather addictive. If you like MGMT, you will enjoy FTP too. The video below shows the band performing in Brisbane, Australia. An official video for the song will be released soon. They’re playing the Lowlands festival next month, which makes me wish I had a ticket. If you do, go see them! The lyrics mentioned in the last post are finished. For now. The song’s almost done too, but it needs one more part to give it more edge. I did a recording of the vocals here at home to hear what it will sound like. It’s still weird, listening to my own words, coming from my own mouth. These lyrics are more personal and direct than anything I’ve written before. I’m wondering if they’re too personal, if that’s possible. Or maybe it’s just too soon. Maybe. Time mellows emotions however, and emotion makes powerful music so waiting is not always better. In fact, if you come out of a difficult situation and the first thing you do is to pick up an instrument and write a song about it, like right after, isn’t that the most compelling piece of music you can think of? Confused, angry, unbalanced perhaps, but so powerful! Alas, it will take a while longer before we can start recording the new songs, this is a band effort after all, but I daresay the wait will be worthwhile. Last Friday we had another rehearsal session in Tilburg, our last before the summer holiday. Ward brought along his friend Merel, who plays violin very well. We jammed a bit and we all agreed it sounded sweet. So we’re working on a new song together. If you love the warm, acoustic violin parts of old Celestial Season (especially the ‘Solar Lovers‘ album) as much as we do, you definitely have something to look forward to! I was penning lyrics for our new song yesterday. Still the most demanding part of the writing process. It literally takes me hours to produce 4 lines that I can live with. And I may still decide to rewrite those. (Un)fortunately, there is plenty of fresh inspiration, it’s just a matter of finding the right words and setting them to music. It’s all rather personal stuff, but I want everyone to hear something they can relate to. Last Friday we had the first rehearsal with our new bass player Harm. Our line up is complete again, at last! Harm’s the youngest guy of Akelei, he’s 20, but he has been playing bass for some years now and he was plucking along nicely during a run of our set. We’re also going to share some vocal parts, background and harmonies and the like, and that’s something we want to employ more in the new songs. Little choir parts like the one on ‘Dwaaluur‘ and entwined vocal melodies. We’re having one more band rehearsal before the summer break and we’ll be back in Tilburg after August. We really want to do shows in the fall as it’s been a quiet half year for us. So get in touch now if you want some Dutch doom on your stage. Liefst iemand die 5-snarige bas speelt. Welcome back music lovers, time for an update. We played our first show since the album release in November, our eleventh in total by the way, two Saturdays ago at dB’s in Utrecht. It was a DIY-deal, which basically means you rent the venue and get to organise your own show. We’d done it before in 2008, together with Machinist & Industrial Passage and Heavy Lord and really enjoyed that experience so we figured we’d try it again. Sharing the stage with us this time around was Hymir, a local group that specialises in performing an atmospheric blend of death- and black metal and slightly symphonic touches. They also released their first album in the previous year, you can check it out on their Bandcamp. The turn out was satisfactory, meaning: not crowded but still a sizeable group of people, not counting the bands. We broke even, also because we sold a couple of cd’s after the gig. A last.fm-user that goes by the name of ‘LastSilence‘ took some pictures with her “old and dying camera”, as she explained later but it sure did capture the essence of an Akelei-show. I’ll post the pictures below. On a sad note: the Utrecht gig was Josha‘s last with us. He’s getting ready with his long-time death metal compadres in Carceri to unleash their looong awaited debut album ‘The Good Must Suffer the Wicked’ and won’t be able to combine this with playing bass for Akelei. We understand his decision of course and thank him for the good times. Josha is a friend (and my brother) so in no way does this mean we won’t be seeing each other anymore.